The hike from Belap to Bettmeralp explores the north side of the Rhone Valley in central Switzerland. It’s a popular stretch on our Secret Swiss Valleys tour, and it rewards hikers with expansive views of the Aletsch Glacier, the longest glacier in Western Europe. With a well-known geologic wonder like the Aletsch commanding the stage, it’s easy to forget about the other big names dancing across the southern horizon. “Just turn around,” we always say to our guests. When they do, they act as though they’ve been immediately caught off guard. The Matterhorn pokes up from behind the hills the way a trickster might hide in the bushes and say, “boo!” This is what we mean when we say that a particular hike offers a surprising view of the Matterhorn. 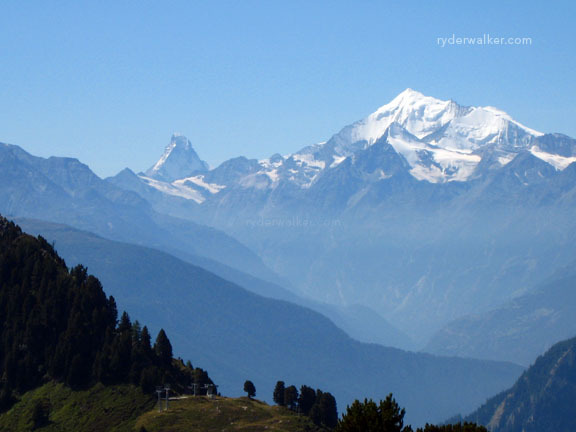 Note: The largest peak to the right is called the Weisshorn (4505 M). Thanks Kenny. It's about time to get locked out of sudtirolean hotel again. Let's chat soon!